January 19, 2015-Kissimmee, FL — It took holding off a late rally, but the Chicago Royals held on to a 9-7 lead to defeat the Miami Marlins and win the 2015 Holiday Classic 45+ Championship at Champion Stadium at ESPN’s Wide World of Sports Complex. 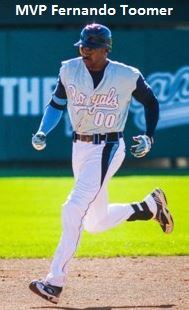 Led by MVP Fernando Toomer, who had a single, a triple and a sacrifice fly while driving in four runs, the Royals used a three-run sixth and a two-run seventh to build an 8-3 lead. However, the Marlins staged a late rally with a four-run eighth that closed the lead to 8-7, but an insurance run and a save by P.J. McQuillin gave the Royals its first 45+ championship and the first by a team not the Boston Wolfpack in the past four years. The Marlins had a chance to take the lead, but lined out with bases loaded and two outs that ended the eighth-inning rally. The Marlins were able to knock off defending champion Wolfpack by narrowly defeating them 8-7 thanks to four-run first and second innings. On Monday the Royals started Kal Tate on the mound and he would pitch seven-plus innings and give up five runs on 13 hits. The Marlins had the lead three times, but each time the Royals tied it up until it was 3-3 and Chicago then took the lead it wouldn’t relinquish. Last year the Royals lost to the Wolfpack in the same game, so manager Mike Torresso was just glad to face a different team, even one just as a good as the Marlins. Torresso also said it was an easy call to name Toomer the MVP.